Priorclave’s QCS front-loading autoclave range should help any laboratory increase its sterilising throughput thanks to a combination of an improved load capacity and strong operating performance. These factors mean that the QCS autoclaves, with their large-capacity 500mm diameter sterilising chambers, will appeal to both in-house and contract laboratories serving industrial and research sectors such as food and pharmaceuticals. Investing in a Priorclave QCS steam steriliser provides greater versatility where the scale of items needing to be sterilised may vary significantly. Both small and taller items can be processed in a single machine run, making it likely that they will be able to cater for a laboratory’s daily throughput. 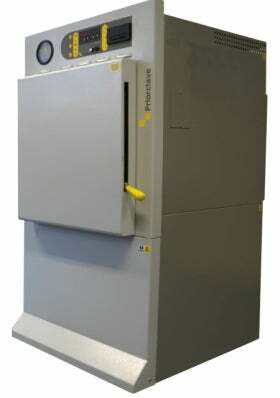 As part of its comprehensive standard range of laboratory autoclaves, Priorclave has introduced three standard-capacity QCS front-loading steam sterilisers; 100, 150 and 200 litres, delivering temperatures up to 140°C at 2.4bar, all of which are easily controlled through the Tactrol® 2 microprocessor system. Temperature and time can be adjusted for simple cycles or fully featured multi-programme operations with printed records. This allows unrivalled flexibility, monitoring and management of the process cycle. For the busy working environment, the QCS is ideal. It automates the sterilising process and, with features to assist in autoclave management, it enables laboratory staff to continue with other tasks secure in the knowledge that sterilisation is proceeding safely and efficiently.